A note before I get into the meat of this update. I adapted this city from a previously created city posted on the Thieves Guild. The Thieves Guild is a great old website with lots of ideas for roleplaying games. I’d definitely recommend checking out the Thieves Guild if you’re a DM/GM and in need of some inspiration. The original content for this city post is called the City of Stormfront by The Guildmaster and can be accessed using this link. The Guildmaster also made a map of Stormfront that I’ve adapted for Bradel Fields. The map has little numbers on it denoting the locations that are marked in the writeup with numbers like this (#). Bradel Fields, a city with population of close to 30,000, was originally a monarchy. The kings were fair and just, and slowly gave the citizens democratic concessions as they were demanded before abdicating. The noble family split into six smaller families after the Bradel Council took over. The castle was converted into a guard barracks and the royals moved into the castle courtyard, now called Noble Way. 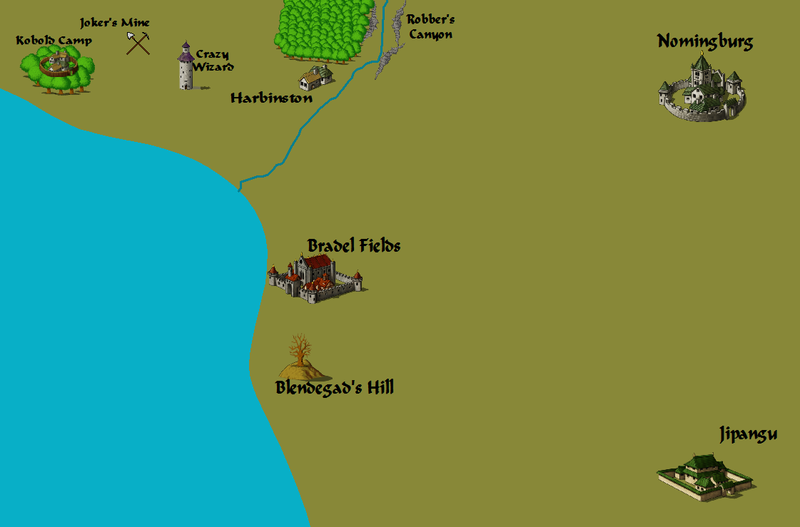 The Bradel Council originally gave a pension to the nobles, but the pension fund dwindled over the years and the remaining nobles have sought other forms of income. Most have become entrepreneurs, army soldiers, navy sailors, or taken positions in the Council. The new Bradel Council rules from the old courthouse (2). The three new sections at the sides and back have been added to hold the growing democratic bureaucracy. The Bradel Council is split into different parts which discuss and vote on different issues. The different sections are Police, Army, Agriculture, Commerce, Internal, and Supreme. The supreme section has the power to override any decision made by the other sections. When new councilors run for office they must choose the section they are running for. The term of a councilor is six years with thirty councilors elected every year. Each building in the city gets one vote to appoint councilors. All bills are passed by majority. The arena (1) is a large pit used for battles to entertain or deliver justice. Spectators look down from the upper level, witnessing bloodshed of all kinds. Gladiators walk out along a special platform and down a ramp into the pit for battle. This platform is ten feet lower than the spectator stands, and ten feet higher than the bottom of the pit. At the northwest section of the pit through a large wrought iron gate animals and monsters are brought in whenever they are required to fight. There is a betting parlor near the entrance where the labor is all Elves. The arena is a business venture started by the secretive Elves of Valor’s Forest. The temple (3) is surrounded by an eight foot wall with large iron gates which are always open. The interior of the wall is decorated with a large flower garden adorned with statues of the twelve Olympians. The temple itself sits at the far end of the garden, on the other side of the main gates. The temple is a tall majestic building with golden towers and glistening gates. A small bridge on the second floor extends from the rear of the temple over the nearby street, connecting to a small building across the way where the clergy reside. The Hall of Knowledge (4) is a large wooden library with a stone foundation. Inside are hundreds of shelves of books, tomes, and papers containing information of all sorts. The library does not rent out books and ones containing spells are restricted to citizens who have had library cards for over a year. The knight’s guild (5) is nestled close to the city docks and guard barracks. The noble warriors of the city reside in this large stone keep near the waterfront. The keep was built long ago to provide protection for the city, and looks to be a military masterpiece of protection. Yet, regardless of the building’s strong exterior, it is rather comfortable and welcoming inside. The guild is in charge of the city’s army. The current Guildmaster is Cheregon one of the noble lady-knights from House Tiisson. Entrance into the guild is restricted to citizens of the city. There are about five hundred policemen based at the city police barracks (6) who keep trouble off the streets and out of the farms and slums if they can. They are trained at the city guard training area. Two galleons and six frigates take port at the city navy base (7). Members of the knight’s guild are the sailors on board when needed. The Harbor Master (10) collects the fees for any trade goods brought in by sea and for docking your ship, dependent on size. The ranger’s guild (20) is a two story wooden building that provides the home for the rangers of the city. The forest gate (27) leads directly to the forest and the city’s graveyard. Between the courthouse and the arena is a statue (9). It shows a marble Zeus dropping a granite mountain on top of an obsidian Typhon. The eyes are gems, Zeus’s clothes gold, and the point of Typhon’s tail is Adamantite. The city is immensely proud of its statue constructed by Phidias the sculptor. Bradel Fields is unique in having a jail for punishment instead of just holding people before trial. The city’s jail (11) is a large building standing three stories high. There is only one entrance, through the front gates. Guard towers are posted on the roof, looking down on the crowded streets of the city. Dim lights can be seen through the few barred windows of the building. Rumors have it that the jail goes several stories below ground, housing more than criminals, but demons and other monsters as well. Some say there is even a connection to the Underdark. Of course such things are only myths the Bradel Council says. The super store, the Red Dragon Warehouse (12), is the hot spot for adventurers and people wanting something you that cannot be obtained anywhere else. The three story high building sits near the private docks of the noble merchants, and is surrounded by a twelve foot high wall. The prices are more expensive here, but the selection is almost endless. Seagulls constantly circle the flat roof of the building, where several smaller buildings sit. The owner is Trobador, a Halfling who inherited the business and has been expanding it even further. The Red Dragon Casino is owned by Trobador as well. He has many interesting physical games inside as well as the normal card and dice games. A lot of the gladiators spend their winnings in the casino. The owner also does an event at the Arena once every four years. A Red Dragon is captured by his employees and gladiators go up against it one at a time for the whole day or until the Dragon is defeated. Trobador has to put some heavy wards down to protect the spectators, but the event is the biggest festival in town. The Adventure Dome (14) is a mysterious building that gives a unique experience to anyone going inside. No one knows who built it, but the person selling tickets is a Dryad. No one knows her name, where her tree is, or what she does with the money she earns, but most assume the answers can be found in the dome somewhere. The walls surrounding the mage’s tower (16) are smooth gray stone. They appear to be easy to climb; but in actually are extremely slippery. There appear to be no windows or entrances to the inside. Only members of the mage’s guild know how to access what’s within. They contact you to make you a member not the other way around. The Bradel Fields tavern (17) is a large wooden building providing a place of rest for weary travelers and a space to mingle for citizens. Drinks are served at all hours in this fine establishment. Rooms are also available; one just has to ask the manager. The tavern employs over a hundred people to service its clients. The bard’s playhouse (18) is a large modified theater no longer used for performances that houses the city’s bards. This building provides a place for bards to eat, sleep and practice. Work for actors and stage hands can be found in this cozy establishment, along with prestige and talent. The Grand Theater & Music Hall (19) is near the richest part of the city (The noble section, located on Noble Way). Inside is an enormous theater which can seat thousands. Plays, ballets and musical performances of only the highest quality take place here once every ten days. The psionicist’s guild (21) is located on the first and second floor of this three story building. It is the only well known place to get information on psionics or to train in its art. Many of the teachers in the guild believe that psionics is the way for humans to become equal to Angels and Devils. There is also a cartel of Mindflayer hunters in the guild. The guild owns the building, but must rent out the bottom floor to cover costs. The current renter, a bard living at the playhouse, uses it as a dance studio. Warrior’s Rest (22) is a private establishment which caters to warriors of all types except the knights and rangers of the city. It is believed that these professions don’t need to take up space at the Rest because rangers and knights both have large guilds that look after them. The tavern also doubles as a tiny inn. Rooms are cheap and the company is often welcoming…as long as trouble isn’t started. The Park of the Traveler (23) where exotic animals of all kinds roam this small forest, rumors say that they appeared one day as the result of some mad magician’s spell gone awry. A group of druids act as zookeepers here and train new druids to coexist with Human society. Because of the nature of some of these animals, this park can be a dangerous place, but still less dangerous then the Park of Delights. Park of Delights (24) is a dark and foreboding place. This park is sometimes used for underworld meetings as a neutral ground. The local guards are often paid to keep clear, and most do so without payment. The park is said to be a home of evil. Disappearances occur often here and every so often a dead body turns up… Some say that an evil cult worships in this small forest, but nothing has been proven. The city graveyard (25) is an enormous area outside of the city where the dead rest. Huge mausoleums and unmarked graves are scattered about. Grave robbery is kept in check by the local grave keepers for a price paid through the taxes of the city. As such necromancy is not a serious problem in the city. Outside of the south gate (26) is an area where poverty stricken people reside. Too poor to afford adequate housing inside the safety of the city walls, these people tend to build crude structures from any available materials. The people here range from petty thieves to crippled indigents. A thief’s guild may exist here, but authorities have not found any evidence so far. The Grain Gate (28) is where a majority of the city’s food is imported through. The farms surrounding the city tend to gather nearest to this gate; although there are still many other farms located near the other gates. In recent history Bradel Fields joined the first and second Alliances against Xoria. During the first war the republic city was led by Hector, a young knight with connections to Princess Tarigananata. Hector died during the war. The second Alliance is led by Hector’s son, Astyanax. Astyanax went through a traumatic incident with a demon. After he recovered he executed Bradel Council members who were against continuing the war and assumed dictatorial control of the city. To enforce his new edicts, Astyanax drafted the goblin slaves of the city into a police force/army. Made with the amazing program, City Designer. Seriously! Check it out!